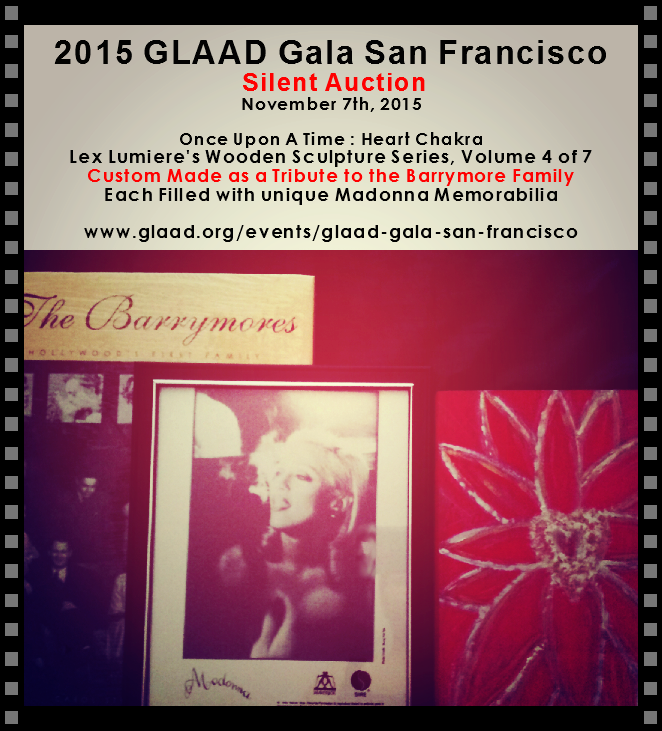 Bid on Lex Lumiere’s ‪#‎Art‬ at the GLAAD Gala silent a‪uction‬, held Friday Nov. 7, at the Hilton ‪‎SanFrancisco, Union Square. Honoring US Chief ‪Technology‬ Officer, former Google VP of Business Development and PlanetOut Inc. CEO ‪Megan Smith‬ along with ‪Youtube‬ sensation, Tyler Oakley. Hosted by, Daniel Franzese. The wooden sculpture, ” Once Upon A Time : Heart Chakra ” is one of the last three in the series currently up for purchase at charity auctions; it is painted in oil, metallic silver and was created as a tribute to the talent of the ‪Barrymore‬ family and their legacy in F‪ilm‬. The bid item includes the wooden sculpture, rare ‪Madonna‬ memorabilia inside and a limited edition book on the Barrymore’s life story.